Adrianne has good cheekbones and a small chin which make this fabulous new short haircut perfect to complement her heart-shaped face. The off-center parting frames and displays her forehead and adds a touch of asymmetrical modern style. Cut to one length with textured ends the style has attractive wispy ends. Adrianne is a sporty young woman, who likes fairly natural and versatile hairstyles. And this fabulous style gives the option of wearing it curly, wavy or straight. In this photo, the hair is given sophisticated texture and volume with a ‘bend’ rather than an actual wave for super-trendy chic. And Adrienne’s dark blonde hair is subtly highlighted with wheat shades, keeping the look natural to match her preferred style. This highly contemporary haircut is a great choice for keeping the focus on pretty facial features! 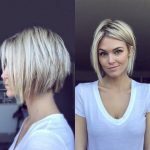 This cute short bob hair style is perfect for oval, round, square, heart face shapes.